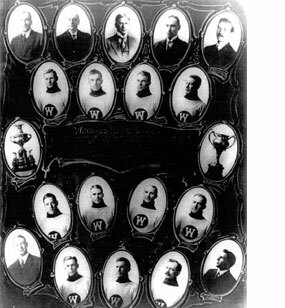 Manitoba continued to dominate the newly minted trophy for Canadian senior amateur hockey supremacy after the 1911&12 Winnipeg Victorias, with the 1913 Winnipegs. The Winnipegs defended the cup twice at home in March, defeating both Moose Jaw and Edmonton. ROSTER: Top Row L-R: H.G. Mayes-Vice-Pres., D.H. Cooper-Patron, A.J. Andrews-Patron, C.M. Ruttan-Pres., D.W.F. Nichols- Sec'y/Treas. Third Row L-R: Ollie Turnbull-Point, Jack Gannon-Goal, Al Adamson-Captain & Left Wing, Jack Ruttan-Cover Point. Second Row L-R: J.E. Aldous-Centre, Billy McKenzie-Right Wing, Bert Andrews-Rover, W. Currie-Spare. Bottom Row L-R: Percy Brown-Coach, P.J. McKay-Spare, H.O. English-Spare, W. Law-Trainer, W.W. Breen-Coach (Missing from Picture: Jack Hughes- Spare).